PTSD, addiction, depression and suicide are just some of the problems often facing veterans. But one local veteran has found creative relief with the help of the Milwaukee VA Medical Center. Veteran Shelly Lopez earned first place at the Milwaukee VA Creative Arts Festival in 2018. Her winning piece is called "The Mask I Wear." "I put the crosses over the eyes because that represents spirituality for me," she said. Pewaukee Man Prepares For "The Voice"
After two deployments Lopez suffered addiction, anxiety, and depression . "I was in the service got hurt..had emergency open heart surgery. I was prescribed opiates, became addicted to painkillers and opiates, I became homeless. I had nowhere to go," she said. It got so bad, Lopez almost gave up on life. "At one point I attempted to take my own life after I'd been assaulted. I took a bottle of pills and just thought the world was pointless so what does it matter if I die now or 50 years from now," said Lopez. Residential treatment and art therapy gave Lopez a new will to live. "I suffer from self esteem issues. It's something that has bolstered my self esteem issues. Working on art and receiving feedback and having people relate to it," she said. Through art Lopez expresses herself when the words don't come. "There's a joy I cant even describe accurately I could probably draw it for you," she said. Now Lopez volunteers, helping veterans draw out their pain through art. "There's a saying you have to give it to get it. The more I share my story and they get something out of it the better I feel," she said. 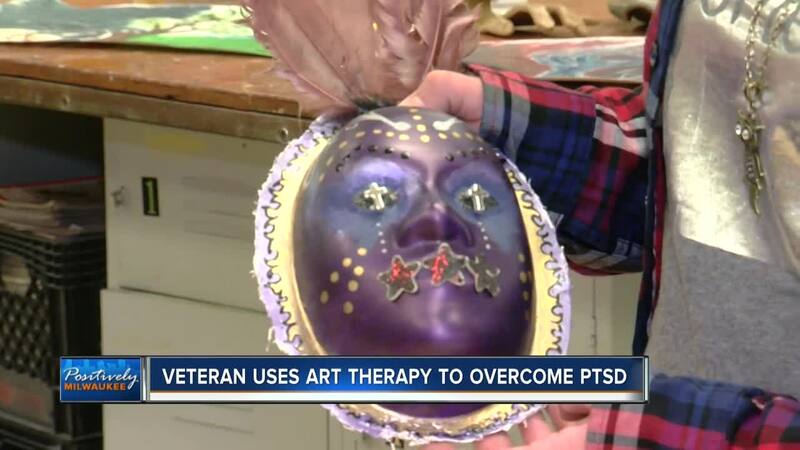 Lopez is convinced art therapy can save the lives of lost heroes. "There are so many people I've served with who took their own lives, I just kept thinking if they could have come to the va they could have been in this art group maybe they wouldn't be gone." She says discovering art was like learning to breathe again. "It gives me hope, it gives me faith, I'm so grateful I have art in my life"